Made by Fenton Glass for MBM in the late 1990s. Measures 11 1/2" across X 6.25" high. Excellent condition with no chips, cracks, scratches or other damage. Sure to be welcomed into any collection! 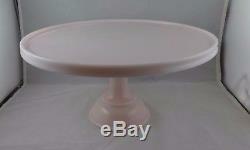 12 Inch diameter Pink Milk glass Pedestal Cake stand. Hard to find these cake stands these days. It doesn't show well in the pics, but is easily seen in person. THIS LISTING IS FOR THE 12 INCH stand! 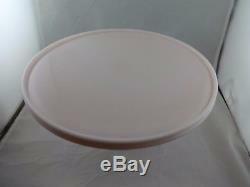 Very lovely shade of pink, just a bit deeper than shell pink. The rim is slightly raised around the edge. 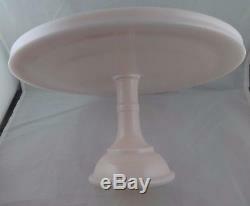 This cakestand looks great on its own or with the smaller one stacked on top. Never used, only stored in cabinet. There are no chips, cracks or other damage. 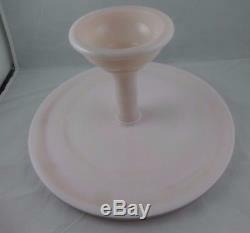 The item "Martha Stewart By Mail Shell Pink Milk Glass 12 Large Footed Cake Plate Stand" is in sale since Sunday, November 12, 2017. This item is in the category "Pottery & Glass\Glass\Art Glass\North American\Fenton".roses" and is located in Rochester, New York. This item can be shipped to United States, Canada, United Kingdom, Denmark, Romania, Slovakia, Bulgaria, Czech republic, Finland, Hungary, Latvia, Lithuania, Malta, Estonia, Australia, Greece, Portugal, Cyprus, Slovenia, Japan, China, Sweden, South Korea, Indonesia, Taiwan, South africa, Thailand, Belgium, France, Hong Kong, Ireland, Netherlands, Poland, Spain, Italy, Germany, Austria, Israel, Mexico, New Zealand, Philippines, Singapore, Switzerland, Norway, Saudi arabia, Ukraine, United arab emirates, Qatar, Kuwait, Bahrain, Croatia, Malaysia, Brazil, Chile, Colombia, Costa rica, Panama, Trinidad and tobago, Guatemala, Honduras, Jamaica, Antigua and barbuda, Aruba, Belize, Dominica, Grenada, Saint kitts and nevis, Saint lucia, Montserrat, Turks and caicos islands, Barbados, Bangladesh, Bermuda, Brunei darussalam, Bolivia, Ecuador, Egypt, French guiana, Guernsey, Gibraltar, Guadeloupe, Iceland, Jersey, Jordan, Cambodia, Cayman islands, Liechtenstein, Sri lanka, Luxembourg, Monaco, Macao, Martinique, Maldives, Nicaragua, Oman, Peru, Pakistan, Paraguay, Reunion.